The popular live-streaming app Periscope is giving real estate agents and brokers a compelling new way to digitally engage homebuyers and clients in real time. Houlihan Lawrence, a brokerage based in upstate New York with over 1,200 agents, and North Carolina-based Triangle Real Estate Group, which has 17 agents, are both experimenting with Periscope. 3-D immersive virtual tours, automated listing videos, private live virtual tour tech and professionally produced videos give buyers a virtual feel of a home. But Periscope allows users to broadcast live video shows through Twitter. Agents using Periscope interact with a broad audience in real time. They allow viewers to interact through comments and “likes” with both the videos and the brokers and agents filming them. 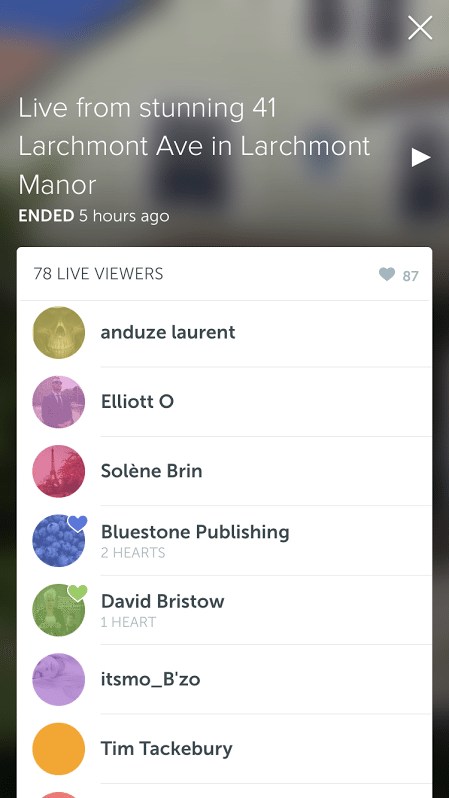 Screenshot of metrics for one of Houlihan Lawrence’s Periscope tests. Houlihan Lawrence envisions pairing a Periscope live feed with open houses, Anne Marie Gianutsos, the firm’s head of digital, told Inman. By publishing a Periscope video a few minutes before an open house officially starts, Houlihan Lawrence agents can give buyers a preview of properties they may not be willing to take the time to visit in person based on photos or descriptions alone, Gianutsos said. A preview will convince them to pass or inspire them to come visit, streamlining their house-hunting work in the process, she said. The firm tested the platform at three open houses on a recent Sunday. To drum up an audience, it sent out a companywide email and mentioned the experiment in its newsletter, which goes out to 50,000 subscribers. The first attempt failed because the cell signal wasn’t strong enough and Wi-Fi wasn’t available. With a strong Wi-Fi signal, the second test worked; 83 live viewers tuned in to this open house. With the help of the comment feature, the listing agent giving the tour was also able to answer some viewer questions on-site. The third attempt was also successful. The feed had 78 live viewers and 87 “hearts.” A heart indicates a “like”; they show up every time a viewer touches the screen during a live feed. Triangle Real Estate Group had 13 viewers on its first Periscope test. The technology allows homebuyers to see raw, real footage of a home, not just images that have been “scrubbed and edited,” said Katherin Burnette, owner and CEO of Triangle Real Estate Group. That real-life element makes Periscope a compelling new tool for the firm, she said. Meerkat and Periscope allow homebuyers to see raw, real footage of a home. Periscope also allows users to save their broadcasts as videos and republish them to other platforms, and Triangle Real Estate Group is looking to repurpose them in Facebook advertising by way of YouTube. That’s exactly what Triangle Real Estate Group did with the video for a Raleigh listing. It recently posted one video originally broadcasted through Periscope to Facebook and boosted the post. In the Facebook ad, it targeted a specific audience who it thought might be most interested in the property, Burnette said. Triangle Real Estate Group used a video originally broadcast through Periscope in a Facebook marketing campaign. Burnette says the firm plans to use Periscope to market its listings before they hit the market and to give neighborhood snapshots to homebuyers.